Notes from the Cambridge House Silver Summit - Cambridge House puts on some of the best commodity-focused investment conferences in the industry and this year was no different. The February show in Phoenix, Arizona included presentations from industry heavyweights such as Ted Butler, Bill Murphy, Jay Taylor, Mickey Fulp, John Kaiser and others. Over 40 booths were filled with up-and-coming junior resource miners, including one of my favorite silver plays, Aurcana Corporation (CVE: AUN or AUNFF). Aurcana stock advanced as much as 19% today, the first trading session following the conference. Aurcana just began construction on their Shafter mine in Texas, which is estimated to be one of the top ten largest silver mines in the world. In addition the company is already producing one million ounces from its La Negra mine in Mexico and is projecting a jump to 5 million ounces per year once Shafter comes online. 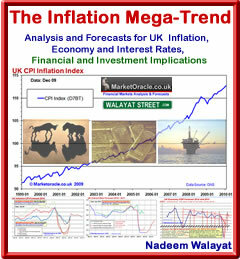 The last UK inflation data came in at CPI 3.3% and RPI 4.7% for November 2010, with real inflation at just above 6%, this is set against a continuous mantra in the mainstream press by pseudo economists / journalists that high inflation of above 3% was always just temporary and that it would resolve in a sub 2% rate by the end of the year (2010). Now a year on the same people that had misguided their readerships for virtually the whole of 2010 into avoiding inflation protection strategies that the coalition government has proceeded to strip away during 2010 such as scrapping of the RPI linked Index Linked National Savings certificates in June 2010, and are only now warning their readership's of the consequences of persistently high inflation that looks set to continue during 2011. Gold has fallen in dollars but is flat in sterling and euros this morning. Moody's has cut Spain's debt rating on contagion concerns which has seen the euro fall. Germany's opposition to further government financed aid is leading to tensions with the ECB, which is itself now under financial pressure and may need an increase in capital if it is to continue buying sovereign European debt. Peter Krauth writes: Forecasting prices for anything can be tricky. And a precious-metal commodity such as silver is no exception. With gold holding the leash on its "lapdog" - silver - the performance of the so-called "yellow metal" holds the key to silver prices in the New Year. The Euro-zone continues to teeter over the edge of the financial abyss as bankrupting countries that cannot print Euro's threaten the collapse of its banking system that would would soon collapse the whole global banking system in a matter of hours as electronic bank runs sweep across the worlds financial system resulting in trillions of dollars worth of deposits being withdrawn in a matter of hours and thereby collapsing first the Euro-zone and then within 24 hours the UK, USA and Asia along with it. My recent article (Euro-Zone Prepares to Print Trillions in Advance of Greece Debt Default) covered the potential consequences for the world in the event of financial armageddon, this article continues on from the last article that covered the inflationary depression consequences of money printing that the likes of Britain and the United States are engaged in and that the Euro-zone WILL eventually replicate (Bank of England's Quantitative Inflation Bankster's Paradise Inflationary Depression Economy ). Something big is going on in the United States in a sentiment change, an altered state of psychology, a growing sense of panic. My opinion is that the nation has entered the early stage of comprehension among the population of systemic failure. The most immediate measures are the rash of heavy selling down days in the US Stock market, the strong purchases in Gold, as well as the reactions to constant news of sovereign debt in trouble, and the big banks teetering. Several other softer measures have been noted, made overwhelming by their sheer numbers. A perception wave has taken hold of a toxic USEconomy, a toxic US financial sector, a toxic US housing sector, a toxic economic brain trust in the US towers. A sense of doom is creeping into the nation's living rooms and board rooms, that the nation is in deterioration. Worse, they are realizing how US Federal Reserve is toothless, unable to address or treat the problems. The Greek population is in constant revolt with another 48 hour national strike underway against ever expanding announcements of economic austerity though to date little of which has actually been implemented and therefore risks at the very a least a delay of the latest tranche of Euro 12 billion in what has now become a permanent flow of funds from core Euro-zone to Greece and other peripheral eurozone countries, therefore tax payers of core Europe and to a lesser degree Britain are being taxed to pay for the unwillingness of the PIIGS to pay their bills. Barack Obama and his minions were out in force on Friday declaring that the 216,000 jobs added in February are proof of a recovering economy. The unemployment rate fell to 8.8%, down from 9.8% in April 2010. All it took was 2.8 million Americans to leave the labor force to achieve this fabulous reduction in the unemployment rate. The percentage of Americans in the labor force of 64.2% is the lowest since 1983. The employment to population ratio of 58.5% is also the lowest since 1983. These atrocious figures are after a supposed economic recovery that has been underway for the last 18 months. Wishing a Happy and Prosperous New Year to all. Do you have any further ideas as to where you see the FTSE and DOW going over the next six months.